So the internet is all totally on fire because Wonder Woman changed her clothes. Cool. Hater’s gonna hate. Defenders gonna defend. Commentators gonna comment. I mean, I think she’s done it quite a few times, so it doesn’t seem like a big deal to me, but this one is being billed as a (or THE) big costume change. Honestly, though, having studied the timeline so much at this point, I think we’d really have to see if it sticks before talking about how big a deal it is. Anyway, check it out. Pants! I think pants are good, right? The leather jacket is a thing. Does it mean..
1. Leather jackets are back in? Is it even leather? Maybe it’s pleather. Or that weird synthetic stuff. 2. 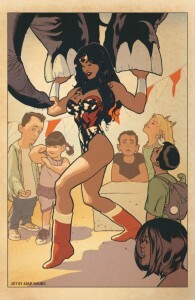 Wonder Woman is wearing it out of a slightly dated desire to be cool? 3. 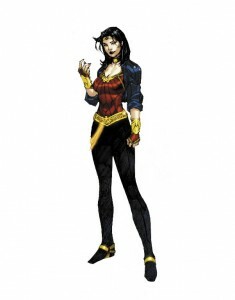 Wonder Woman really loves the Black Canary’s outfit and wanted in on the look? 4. She’s actually wearing it as a retro/ironic style statement? It’s probably the irony, right? I’m fine with losing the flag look. I like the idea of her being more international. Honestly, at first I wasn’t that into it, but after a day of seeing it again and again and again all over the internet, it’s kind of grown on me. Doesn’t it remind you a bit of her 90’s look? 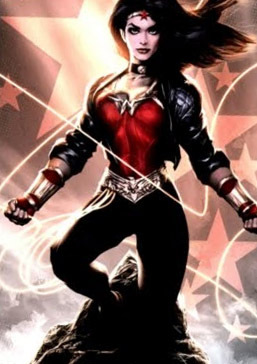 The one when she “wasn’t” Wonder Woman during the Challenge of Artemis arc? Ok, I’ve spent way too much time thinking about superhero fashion today. Not like I’ve cared when the Blue Beetle changed costumes. Or Guy Gardner wore that belly shirt. Well, maybe a little. My favorite part is the girl in the background flexing. She kind of looks like Wondertot, actually, but I’m pretty sure she’s just an inspiring metaphor. Update: Here we go, Yet Another Comics Blog posted a run down of her costumes through the years. Typically I can’t go through write-up for sites, even so would like to declare that this particular write-up very pressured everyone to see and also do so! Your current writing style has become astonished my family. Appreciate it, fairly wonderful submit. Hello. I uncovered your own weblog the utilization of bing. That is certainly a really logically composed report. I am going to be sure to take note of it accessible to get more information within your useful facts. Appreciate a post. We’ll unquestionably returning. The diet consisted of 25% of energy from protein and 45% of energy from low GI carbohydrates such as fruit and vegetables, grains and pulses. Pure genuine pearl powder does not totally dissolve in water or liquid, so be sure you stir as you drink.